Whether you are in a studio or on a stage, a high-quality microphone is a must. Not only does your microphone needs to offer exceptional vocals but should also be durable, light-weight, and efficient. With a market that is filled with different microphones, choosing the right one is crucial and complicated. 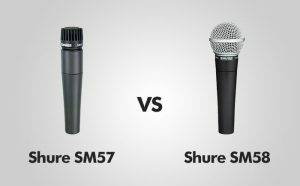 So, here is an in-depth comparison between two of the most popular microphones in the market, Shure SM57, and SM58. Shure is well-known for offering some of the most effective and popular microphones in the market. Both SM57 and SM58 are often found being used on world stages and renowned studios. While both are cardioids dynamic microphones, they do have their differences. Here is an in-depth review and comparison between SM57 and SM58 to help you make the right decision. While both SM57 and SM58 share the same microphone capsule design, their design and features are quite varied. When it comes to SM57, the microphone is integrated with a grille or resonator assembly so that instruments and amplifiers can be played closely. The distance between the top of the grille and the diagram is quite short which creates an enhanced proximity effect. This results in a more pronounced and natural bass, and low-frequency response. The design is quite durable and strong. Damages, spills, bumps, or any such damage will not be able to affect its performance. Though, the one problem we had with this design is the lack of a power switch. It can get quite frustrating and inconvenient during live shows or recordings. When it comes to SM58, the outer design is quite different. This model features a ball grille for better and more enhanced vocals. The ball grille along with a built-in pop filter reduces any plosive consonant and makes vocals clearer and more accurate. The overall design is quite durable. The rugged construction and the grille keep the cartridge protected and safe from outer damage or moisture. So, even if the microphone experiences some damage during stage performances or saliva during vocals, the microphone will stay safe and protected. Although the microphone feels sturdy and strong, the mic holder is cheap and finicky. We also thought that the power switch was of low quality and could have used some improvement. Well-known as being used by the president of the USA, SM57 lives up to its claims. It is quite dynamic and shows exceptional results in both the studio and on a live stage. The sound pressure level is extremely high, which makes the sound clear and beautiful even if you are screaming into the mic. Being a dynamic microphone, it avoids picking up all the extra sound nearby as the condensers do. It makes recordings so much more clear, accurate, and without any disruptions or glitches. The microphone transfers high notes extremely well and captures the tone of your amp accurately. Whether you are using this for vocals in a studio or on a live stage, the sound stays true, warm, and beautiful. We did find the sound a bit bassy at first but it was easily manageable with some setting changes at its low ends. With a frequency response of 40 to 15000 Hz, the microphone works excellently with most instruments out there. Although we did see some disruptions with a cymbal, it is nothing major and can be managed. The one thing that did disappoint us is its low gain. If you want optimal sound while recording guitar, you will have to keep your amp loud. You need higher input gain to get the best sound possible. While SM57 is versatile and works well in both studio and stage, we found its sound quality and performance better when it comes to recording instruments. The ultimate industry standard microphone for stage vocals, SM58 delivers a phenomenal performance when it comes to its sound quality. It is equipped with a built-in spherical filter to minimize any vocal pops or winds noises that may disrupt your stage performance. The cardioid pattern keeps any unwanted background noise at bay. With the frequency of 50 to 15000 Hz, we found this microphone much better when it comes to singing or giving enthusiastic speeches. But if you want a microphone for playing or recording instruments, SM58 will disappoint you. It does not perform as well for instruments like guitar, sax, and more. The high end is not as clear and pristine as you need it to be. The sound may feel a bit shrill at times. If you want optimum gain, you will have to turn it up to a much higher setting. We even saw some muddiness around 250 db. The sound is definitely not as crispier or as fuller as the SM57 delivers. PROS: Extremely versatile and adaptable / Exceptionally durable / Great with vocals and instruments / Blocks all backgrounds noises / Clean, accurate, and warm sound. PROS: Exceptional for live vocals / Sturdy and durable / Minimizes vocals pops or wind noises / High sound pressure level / Equipped with windscreen & internal shock mount. CONS: Low gain (needs louder amp while recording guitar) / No power switch / Needs setting changes to control the bass / Not great on cymbals. CONS: High end is not as pristine / Low-quality mic holder / Loose and finicky power switch / Some muddiness around 250 db. Both SM57 and SM58 are extremely durable and high-quality. But while both of them have a cardioid capsule, their performances are quite varied. Your decision to choose one totally depends on your requirement. We found SM57 much more versatile and dynamic than SM58. If you are looking for a microphone that works best with instruments or recordings in studios, SM57 is what you need. It is crispier on the highs and much fuller at the low ends. The sound is more natural, accurate, and warm. But if you are looking for a microphone that enhances your stage presence or live performance, SM58 is what you need.